Which Way Will Commercial Cards in Europe Go? The major opportunity should be in the virtual card/SUA space, although starting from a small base, given the inherent advantages to this product. Commercial credit cards include corporate cards, purchasing cards, lodged cards, and recently virtual cards (also known as single-use account, or SUA). Europe has not been a wholesale adopter of the commercial cards model, but expectations for growth of virtual payments are positive, especially in mid-to-large markets. However, new European Union interchange regulations have introduced market noise that bears watching. 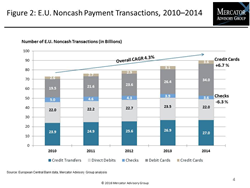 In a new research note, Commercial Cards in Europe: Stagnating or Growing? Mercator Advisory Group reviews the status of European mid-to-large market commercial credit cards. Whilst regional spending volumes have historically been driven by business travel, Mercator sees growth in procurement-related spend finally taking off by virtue of single-use accounts. A review of the European Union new Interchange Fee Reform regulations enacted in December 2015 by the European Parliament and Council of the European Union in Regulation (EU) 2015/751 IFR, which is a part of Payment Services Directive 2 (PSD2). The note is 14 pages long and contains 4 exhibits. Companies mentioned in this research note include Airplus International, American Express, Conferma, Diners Club, Ixaris, JCB, MasterCard, UnionPay, and Visa. Members of Mercator Advisory Group's Commercial and Enterprise Payments Advisory Service have access to this report as well as the upcoming research for the year ahead, presentations, analyst access and other membership benefits. Please visit us online at http://www.mercatoradvisorygroup.com. For more information and media inquiries, please call Mercator Advisory Group's main line: (781) 419-1700, send email to media(at)mercatoradvisorygroup(dot)com. Follow us on Twitter @ http://twitter.com/MercatorAdvisor. Mercator Advisory Group is the leading, independent research and advisory services firm exclusively focused on the payments and banking industries. We deliver pragmatic and timely research and advice designed to help our clients uncover the most lucrative opportunities to maximize revenue growth and contain costs. Our clients range from the world's largest payment issuers, acquirers, processors, merchants and associations to leading technology providers and investors. Mercator Advisory Group is also the publisher of the online payments and banking news and information portal PaymentsJournal.com.